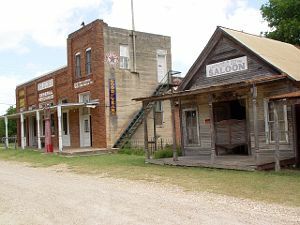 The general store, post office, doctor's office, saloon and blacksmith store at The Grove. If you’ve ever thought you’d like to step back in time, then step into the W.J. Dube General Store in The Grove, Texas. It’s probably the closest you’ll get. My family and I made the trip recently after hearing about The Grove from our friend Fred, who’d visited the historic “museum town” some years ago and deemed it worth the drive. Moody Anderson, an elderly man with an apparent love of the past, is responsible for maintaining the historical accuracy of The Grove. Although Mr. Anderson wasn’t there the afternoon we toured the place (due to ill health, we’re told) a friend of his had opened the doors for others (who want to have a wedding at the site) and that man invited us to take a look as well. The general store is only one of several businesses – there’s also a doctor’s office, a post office, a blacksmith shop, a saloon and others – but it is by far the most spectacular. 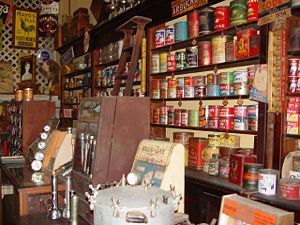 Complete with wooden floors and tin ceilings, the old store is jam-packed with things from the past, including bolts of material, threads (still on the wooden spools), shoes, medicine bottles and boxes, tins, house wares, etc. According to a pamphlet available there, the general store supplied the surrounding area with all the essentials of life – including a social gathering place where folks could sit around the wood-burning stove and swap stories. There are old coffee grinders, washing machines, coffins, tools, and hardware items on display as well. Some of the stuff was original to the store, and other pieces were collected through the years. 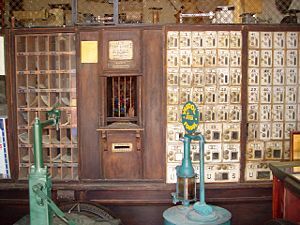 The Planters State Bank, established in the early 1900s, occupies one corner of the store, and the pamphlet notes that the original fixtures – including a walk-in safe – can be seen just as they were when robbers made an unscheduled withdrawal in 1927. If you walk through a door on the opposite side of the general store, you’ll find The Grove U.S. Post Office, established in 1874. The original window and numbered boxes are still in place. In the center of the road that runs in front of the buildings, there’s a well. It was the original water source for The Grove, and has allegedly never gone dry. A doctor’s office (which we did not see the inside of) is directly upstairs from the post office. It was noted that the first doctor arrived in the area in 1867 and that the office is outfitted with items typical of medical offices of that time period. We were also told that the furnishings and materials in that office were used in the movie Lonesome Dove. In addition to the general store and post office (a quick look) two other businesses we got to tour were the blacksmith shop -- packed with old tools of every kind – and the Cocklebur Saloon. 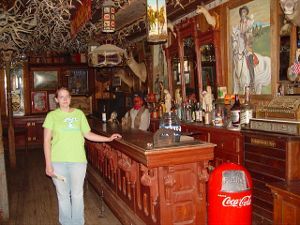 According to the young woman who was planning her wedding when we were there, the saloon is sometimes used for private parties, but that often visitors and tourists can purchase soft drinks there as well. The young woman said she’d heard that the group of buildings – representing life as it will never be again – was up for sale. I can only hope that whoever purchases it doesn’t change a thing. According to the Handbook of Texas, in 1900 The Grove was one of the most prosperous towns in the county. In 1904, it had a two-teacher school with 60 students, and many businesses. The community began to decline in the 1940s, when it was by-passed by State Highway 36. A short-time later, some farmers were forced to relocate when Fort Hood was established, and others lost land when the Belton Dam was built in the 1950s. The population was listed as 65 in 2000. But at 6 p.m. on the third Saturday of every month, new life is still breathed into the old town, when musicians from around the state gather to play and sing at The Grove. According to the pamphlet, there are professional musicians as well as amateurs who perform and there are always plenty of those “who just like to listen” in attendance. I’m sure there is music from many eras presented, but I can’t help but believe that the buildings themselves must surely enjoy the old stuff. Just inside the front door of the W.J. Dube General Store at The Grove, Texas. The old post office at The Grove, Texas. It opened in 1874 and closed in 1996.. In this store's heyday the wood-burning stove was a social gathering place. The Post Office is through the door in the background. 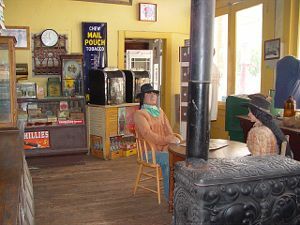 Coby Kestner at the historic Cocklebur Saloon at the museum town The Grove. 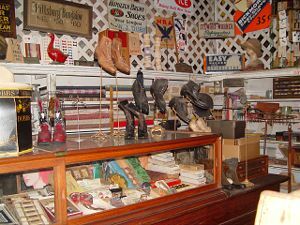 Old shoes, hats, collars and bolts of cloth are among the many, many items on display at the general store at The Grove, Texas. 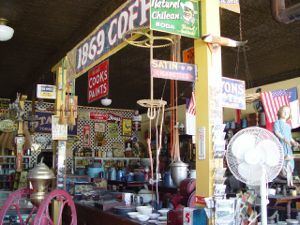 Some of the items in the general store, at The Grove, including coffee tins, tobacco containers, etc.